With dogged persistence Councillor Eli Melky has succeeded in getting the Town Council to agree to pay off its Civic Centre loan. This will save the ratepayer $104,388.00, he said, and council’s Director of Finance, Dinesh Pillay, did not demur. Right: Crs Jade Kudrenko and Eli Melky during the loan repayment discussion. In rapid fire, Cr Melky – a qualified credit advisor who “cannot afford to be one cent out” in his mortgage broking business – ran over the series of calculations that got him to this amount, down by some $40,000 to $60,000 from earlier figures, but still a significant sum. These were backed by an exhaustive series of meetings on the loan payout that he had conducted on his own initiate, not only with Mr Pillay, the CEO, the Mayor and Deputy Mayor, but with bank executives, six independent groups qualified in financial areas, and an accountant, twice, to double check his figures. He was also confident of community interest in the move, on the basis of multiple media reports, including those in the Alice Springs News Online, as well as discussion on Facebook and with four community members who called into his office. Council will draw on its Capital Infrastructure Reserve for this purpose, and the reserve will be considered for reimbursement at council meetings in October 2017 when (the newly elected) council will have to hand the audit report for 2016-17. Some money, set aside in the budget for meeting the fixed loan payment schedule, is available, leaving around $.5m to be taken from the reserve. 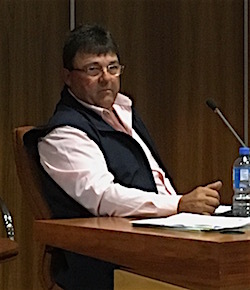 Cr Jade Kundrenko, who previously wanted to defend this reserve from being used, asked Mr Pillay whether any other unspent moneys could be identified for the purpose. However Mr Pillay recommended the reserve as the source. Following the unanimous vote, Cr Kudrenko shook Cr Melky’s hand in congratulations, and deservedly he looked quietly pleased. Above: Director of Finance Dinesh Pillay, CEO Rex Mooney and Mayor Damien Ryan. In this matter Cr Melky has shown himself at his best. In contrast, in general business at the end of last night’s meeting, he showed his tendency to woolliness, raising the issues of youth crime and antisocial behaviour without any focussed action in mind. The discussion was prompted by last Saturday’s community meeting on the issues, called by local businessman Wayne Thompson. Cr Melky wanted council to get involved, to back the meeting with its resources, but Mayor Damien Ryan pointed out that Mr Thompson and the group he is assembling as a result of the meeting have yet to formulate their plans or demands. He asked Cr Melky to put some “meat on the bones” of his discussion. Interestingly, in contrast to Cr Melky’s previous campaigning, he promised that he would not talk about a curfew, directing this comment to Cr Kudrenko. He said his position has “evolved” and he has come to see that a curfew may do “more harm than good”. He referred to someone at the meeting speaking of being “kind and to provide love rather than being hard-hitting” and, by way of example, suggested that council, with support of the business community, could get involved in blanket distribution through the course of the night to the young ones not involved with crime but with nowhere to go. It’s not hard to see how this would be fraught. He had other more straightforward suggestions – that council rangers patrol, during the day, hot spot carparks where people are getting their car windows smashed, that council light up more of the dark areas in town and encourage businesses to spend their own money lighting up their shop fronts. However, he did not pursue these, even to the point of asking the Director of Corporate and Community Services to comment or provide information. In the meantime, Deputy Mayor Jamie de Brenni (left) is working to get Midnight Basketball (a national social inclusion program) off the ground locally. At Saturday’s meeting he was approached by the Institute for Aboriginal Development’s Kerrie Le Rossignol, who wants to involve IAD’s senior Arrernte men’s and women’s groups in the initiative. Cr de Brenni is pursuing this. Cr Kudrenko commented that, while “it’s great” for IAD to be involved, a proper approach should be made through the native title holder body, Lhere Artepe, whom council recognises as the peak body for traditional owners. Cr Melky wanted to know how council could work with Lhere Artepe and Tangentyere Council on these issues. CEO Rex Mooney advised that council’s committees, based on formal memoranda of understanding with both, have been “inactive for some time”. Apparently, a second local group was being put together from the meeting: Cr Melky described Edan Baxter (a previous candidate in local elections) as “working the room”, collecting names. However Mayor Ryan said he wanted to hear first from Mr Thompson’s group. So after all the well-meaning discussion, there the matter rests for the time being. I commend the whole of Council and particularly Cr Eli Melky for reaching a decision to pay off the loan. 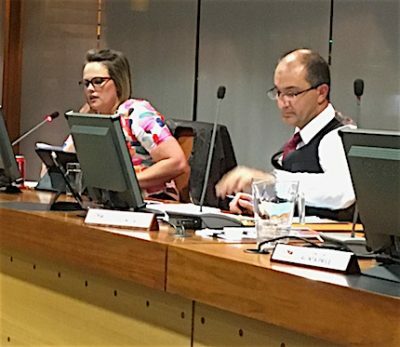 Setting aside the consultative process that occurred and the testy moments when fellow councillors debated the matter, it brought out the best in those we have elected to represent us all at Town Council. As Tony Jones often says at the end of Q&A, “Give yourselves a clap”. Let’s hope OUR $100k gets put to good use. Perhaps some better street lighting in the troublesome areas. Well done Mr Melky, clearly you are one of the few at the Alice Springs Town Council with some business acumen. Good work Eli. Now run for Mayor, please.